Background and objectives: Middle cerebral artery trunk occlusion can cause large infarctions. Clinically, thrombolytic therapy, defibrillation, vasodilation, and surgery are often used to treat these large infarctions. However, the therapeutic efficacy of these therapeutic interventions in promoting prognosis remains controversial. Nalmefene, an opioid receptor antagonist, exhibits a neuroprotective effect. Few clinical studies have reported on the therapeutic efficacy of nalmefene in the treatment of large cerebral infarctions. In this study, we investigated the therapeutic efficacy of nalmefene in restoring the neurologic function of patients with middle cerebral artery trunk infarction while using conventional treatment as a control. Design: A randomized, controlled, prospective trial. Methods: Two hundred and thirty-six patients with middle cerebral artery trunk infarction who will receive treatment at the First Hospital of Jilin University in China will be randomly divided into a control group (n = 116) and a nalmefene group (n = 120). Patients in the control group will receive conventional treatment. Patients in the nalmefene group will receive 10 successive days of intravenous nalmefene hydrochloride injection based on conventional treatment. Outcome measures and preliminary results: The primary outcome of this study is the efficacy rate at 20 days (i.e., 10 days after treatment). The secondary outcomes of this study include (1) the National Institutes of Health Stroke Scale (NIHSS) score at 20 days, which is used to evaluate neurologic function deficits; (2) Glasgow Coma Scale scores at 0 days (before treatment) and 10 days; (3) serum level of matrix metalloproteinase-9 at 0, 5, and 10 days (i.e., before treatment and 5 and 10 days of treatment); and (4) magnetic resonance imaging perfusion images of the head at 0 and 10 days. The results of a preliminary experiment involving participants receiving the same treatment as in the present study revealed that compared with the control group, the NIHSS score was significantly decreased, the efficacy rate was increased, Glasgow Coma Scale score was significantly increased, serum level of matrix metalloproteinase-9 was significantly decreased, cerebral blood flow and cerebral blood volume on the lesion side were significantly increased, and the mean transit time of contrast agent on the lesion side was significantly shortened in the nalmefene group. 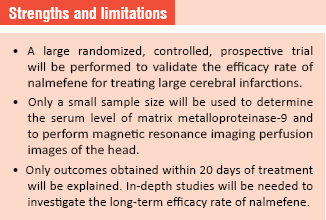 Discussion: Findings from this study will provide clinical evidence for use of nalmefene in combination with conventional treatment for large cerebral infarctions and data to support this combined therapy, which can improve the prognosis in patients with large cerebral infarctions. Ethics and dissemination: This study was designed in December 2011. Clinical ethics approval was received in November 2017. This trial was registered in December 2017. Patient recruitment will begin in January 2018 and end in January 2019. Data analysis will be completed in December 2019. Results will be disseminated for publication in a peer-reviewed journal. Trial registration: This trial was registered with the Chinese Clinical Trial Registry (registration number: ChiCTR-IOR-17013871). A cerebral infarction refers to a disease of lack of blood and oxygen supply to the brain tissue at the corresponding sites due to acute occlusion of the feeding arteries. Middle cerebral artery trunk infarction likely leads to a large cerebral infarction. Patients with a large cerebral infarction exhibit a larger area of injured brain tissue, more severer neurologic deficits with conscious disturbance, increased intracranial pressure, more rapid and critical disease progression, and a higher (more than 25%) mortality rate than patients with a common cerebral infarction.,, Thrombolytic therapy, defibrillation, vasodilation, and surgery are often used to treat large cerebral infarctions. Nevertheless, there is controversy about the effective rate of these interventions. Thrombolytic therapy for middle cerebral artery infarction reportedly causes bleeding. Use of cerebral vasodilators for acute cerebral infarction can expand normal non-occlusive cerebral vessels, leading to an increase in blood supply to normal brain tissue, followed by worsening ischemia in the ischemic area, i.e., a phenomenon known as “steal in the brain.” Although surgical methods such as decompressive craniectomy can decrease the mortality of patients with middle cerebral artery trunk infarction, they have no obvious effects on patient’s disability. Different from other studies on prognosis in patients with non-large cerebral infarctions,,,,, this randomized, controlled, prospective trial will use conventional treatment as a control and investigate the effects of nalmefene on promoting the recovery of neurological function in patients with large cerebral infarctions caused by occlusion of the middle cerebral artery trunk. Two hundred and thirty-six patients with cerebral infarctions caused by occlusion of the middle cerebral artery trunk who will receive treatment at the First Hospital of Jilin University in China will be randomly divided into a control group and a nalmefene group. Patients in the control group will receive conventional treatment. Patients in the nalmefene group will receive 10 successive days of intravenous nalmefene hydrochloride injection based on conventional treatment. The primary outcome of this study is the efficacy rate at 20 days (i.e., 10 days after treatment). The secondary outcomes of this study include (1) the National Institutes of Health Stroke Scale (NIHSS) score at 20 days, which is used to evaluate neurologic function deficits; (2) Glasgow Coma Scale scores at 0 days (before treatment) and 10 days; (3) serum level of matrix metalloproteinase-9 at 0, 5, and 10 days (i.e., before treatment and 5 and 10 days of treatment); and (4) magnetic resonance imaging perfusion images of the head at 0 and 10 days. provision of written informed consent by the patient’s relatives or legal surrogate. those participating in other clinical trials. those using other therapies or drugs to strengthen their treatment that may affect the assessment of the efficacy rate. This study was designed in December 2011. Clinical ethics approval was received in November 2017. This trial was registered in December 2017. Patient recruitment will begin in January 2018 and end in January 2019. Data analysis will be completed in December 2019. Patients will be recruited from the clinics and wards of the Department of Neurology, First Hospital of Jilin University. Eligible patients will be included after contact with the responsible persons via telephone, e-mail, or webchat. Baseline information collected for all included patients are shown in [Table 1]. A table of random numbers will be used to assign a number to each included patient. Patients assigned an odd number will be included in the control group, and those assigned an even number will be included in the nalmefene group. The assignment protocol will be sealed in an opaque envelope. When eligible patients are included, they will be numbered and then treated according to the intervention methods concealed in the envelope. One hundred and sixteen patients will be included in the control group, and 120 patients will be included in the nalmefene group. The researchers who evaluate the outcomes will be blinded to the grouping. All patients will undergo conventional dehydration with mannitol, glycerol, fructose, Xuesuan Tong, and sodium ozagrel, and receive medication for improving circulation and providing nutrition to the nerves. In addition, patients’ blood pressure and blood lipid level will be adjusted, and their water and electrolyte balance will be maintained. Infection prevention and control will be required. Patients in the nalmefene group will intravenously receive 0.2 mg of a nalmefene hydrochloride injection (specification 0.1 mg: 1 mL; Chengdu Tiantaishan Pharmaceutical Co., Ltd., dissolved in 10 mL of 0.9% sodium chloride solution) twice per day for 10 successive days. The efficacy rate at 20 days (i.e., 10 days after treatment): the efficacy rate at 20 days will be evaluated using the difference in the National Institutes Health Stroke Scale (NIHSS) score between 20 days and 0 days. NIHSS scores indicate the following: 9–12, basically healed; 5–8, markedly improved; 1–4, improved; and 0, not improved. If patients die, their death will be recorded. The percentages of patients who basically healed, markedly improved, and improved among the total number of patients in each group will be calculated. NIHSS score at 20 days: The NIHSS score can reflect a patient’s neurologic function, with a total score of 42 points. A higher score indicates a more severe neurologic function deficit. Glasgow Coma Scale (GCS) scores at 0 days (before treatment) and 10 days (i.e., 10 days after treatment): the GCS is mainly used to evaluate the level of consciousness after head injury. The GCS was first reported in 1974 by Graham Teasdale and Bryan J. Jennett from the University of Glasgow’s Institute of Neurological Sciences. It is mainly used to evaluate eye, verbal, and motor responses. The sum of the scores for these three responses yields a total score for the GCS. Serum level of matrix metalloproteinase-9 (MMP-9) at 0, 5, and 10 days (i.e., before treatment and 5 and 10 days of treatment): the serum level of MMP-9 will be measured using enzyme-linked immunosorbentassay (ELISA) in some patients. The ELISA kits will be provided by Changchun Dingguo Biotechnology Co., Ltd.(Changchun, China). MRI perfusion imaging of the head at 0 and 10 days: Cerebral blood flow, cerebral blood volume, and the mean transit time of contrast agent on the lesion side will be monitored. The study flow chart is shown in [Figure 1]. Outcome measure timing is shown in [Table 2]. 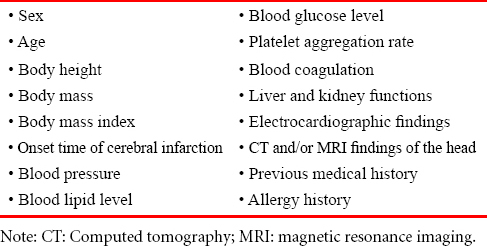 Note: NIHSS: National Institutes of HealthStroke Scale; GCS: Glasgow Coma Scale; MRI: magnetic resonance imaging; MMP-9: matrix metalloproteinase-9. Trial progression will be reported to the ethics committee every 3 months, and data will be updated on the registration website. During the clinical trial, sponsor inspectors will conduct regular periodic visits to the research center to ensure strict adherence to all aspects of the research program. All data will be statistically analyzed using SPSS19.0 software (IBM Corp., Armonk, NY, USA) and expressed as the mean ± standard deviation. Normality and homogeneity of variance will be assessed. One-way analysis of variance will be performed for normally distributed data. The Wilcoxon rank-sum test will be performed for abnormally distributed data. A level of P < 0.05 will be considered statistically significant. Results will be analyzed following the intention-to-treat principle. Our preliminary experiment results showed that the efficacy rate in the control group is approximately 60%, while that in the nalmefene group is about 80%. The sample size will be calculated using PASS11.0 software (CSS Statistical Software, Kaysville, UT, USA). Taking α = 0.05 (two-sided), 1 – β = 0.9, the final sample size of n = 109 per group was calculated. The patient loss rate will be very low because the treatment will be performed in the hospital. Thus, assuming a patient loss rate of no more than 5%, we require at least 115 patients per group. Finally, 116 patients will be included in the control group, and 120 patients will be included in the nalmefene group. The case report forms will be filled out by the researchers accurately, completely, and in time. The written records will be transferred to an electronic format by professional staff using a double-data entry strategy. After checking data accuracy, the database will be locked by the primary investigator and will not be altered. All relevant data will be preserved at the First Hospital of Jilin University. Data will be statistically analyzed by a professional statistician. Anonymized trial data will be published at www.figshare.com. Researchers participating in this study will follow standard operating procedures introduced in the clinical trial protocol to assure quality control of the study. All results obtained in the study will be re-checked. Complete, accurate, true, and reliable data will be acquired. Severe adverse events occurring during the clinical trial will be reported to the ethics committee within 24 hours. The clinical trial protocol was approved by Ethics Committee of the First Hospital of Jilin University. This manuscript was prepared and modified according to the SPIRIT guidelines (Additional file 1 [Additional file 1]). The trial protocol was registered with the Chinese Clinical Trial Registry (registration number: ChiCTR-IOR-17013871). Written informed consent will be obtained from patients’ relatives or legal surrogate. Results of this clinical trial will be published in a peer-reviewed journal and disseminated via various forms of media. Any data concerning patients’ privacy, such as case report forms and informed consent, will be kept separately and confidentially. If necessary, only the researchers, sponsors, inspectors, ethics committee members, and drug regulatory authorities have the right to access all the research records. All efforts will be made to protect the privacy of patients’ personal medical information to the extent permitted by law. The results of a preliminary experiment performed fromJanuary 2012 to January 2016 are shown as follows. Before treatment, NIHSS scores were similar in the control and nalmefene groups. After treatment, NIHSS scores were significantly lower in the nalmefene group than in the control group (P < 0.05; [Table 3]). No patients were healed in the control or nalmefene group. In the nalmefene group, neurological deficits were markedly improved in 10 (20%) patients, improved in 30 (60%) patients, and not improved in 6 (12%) patients, and death occurred in 4 (8%) patients. Treatment was effective in 40 (80%) patients. In the control group, neurological deficits were markedly improved in 7 (14%) patients, improved in 24 (48%) patients, and not improved in 12 (24%) patients, and death occurred in 7 (14%) patients. Treatment was effective in 31 (62%) patients. There was a significant difference in the overall efficacy rate of treatment between the control and nalmefene groups (P < 0.05). Before treatment, the GCS score was similar between the control and nalmefene groups. 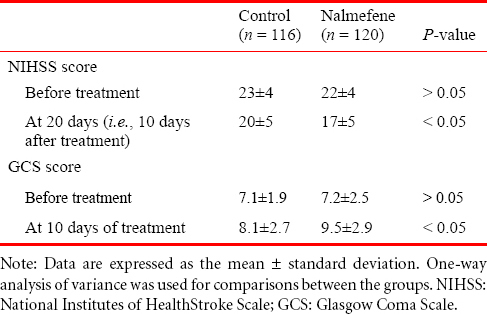 After treatment, the GCS score was significantly higher in the nalmefene group than in the control group (P < 0.05; [Table 3]. Before treatment, the serum level of MMP-9 was similar between the control and nalmefene groups. At 5 and 10 days of treatment, the serum level of MMP-9 was significantly lower in the nalmefene group than in the control group (P < 0.05; [Table 4]). Before treatment, cerebral blood flow, cerebral blood volume, and the mean transit time of contrast agent on the lesion side were similar between the control and nalmefene groups. 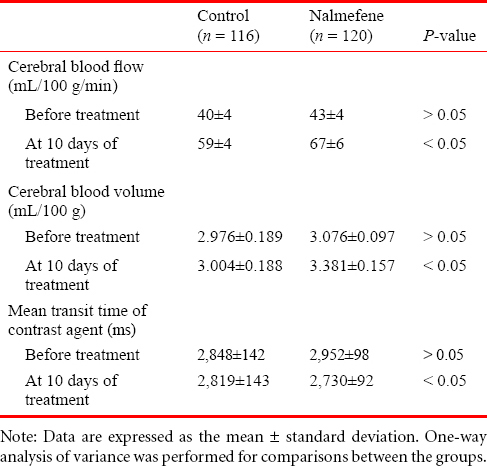 After treatment, the cerebral blood flow and cerebral blood volume on the lesion side were significantly greater in the nalmefene group than in the control group (P < 0.05), and the mean transit time of contrast agent on the lesion side was significantly shortened in the nalmefene group than in the control group (P < 0.05; [Table 5]). After a large cerebral infarction occurs, a combination of many factors results in blood supply disorder in the brain, which finally leads to irreversible hypoxia, ischemia, and necrosis.,, Nalmefene can effectively remove oxygen free radicals and pathogenic factors in the injured brain tissue. In addition, nalmefene administered intravenously exhibits the effects of an antagonist opioid receptor and acts fast, thereby contributing to the treatment of large cerebral infarctions.,,,,, Our preliminary experiment results revealed that conventional treatment in combination with nalmefene administration was superior to conventional treatment alone in terms of therapeutic effects, as evaluated by the NIHSS score, GCS score, serum level of MMP-9, and MRI perfusion imaging findings of the head, with an increased efficacy rate near 20%. These findings are of great significance for improving the prognosis of large cerebral infarctions and improving patient’s quality of life;therefore, they should be disseminated in the clinical setting. Detection of the serum MMP-9 level and MRI perfusion imaging of the head will be performed only in some patients. The anticipated sample size is small. In addition, MRI perfusion imaging findings of the head can reflect the microcirculation of perfused brain tissue. However, MRI perfusion results are likely affected by the injection speed and amount of contrast agent, cardiac output, and whole-body blood volume. Moreover, only the outcomes within 20 days will be analyzed. Long-term curative effects of nalmefene deserve to be further investigated. Yu J, Lian Z, Wang W, Wei Y, Wang M, Feng J. Parapharyngeal space acinic cell carcinoma after operation in patients with internal carotid artery embolism caused by acute large area cerebral infarction: a case report. Zhonghua Er Bi Yan Hou Tou Jing Wai Ke Za Zhi. 2014;49:512-514. Li T, Tian GJ, Yu JC, et al. Effects of acupuncture on nervous function in the patient of extensive cerebral infarction after operation. Zhongguo Zhen Jiu. 2008;28:869-872. Li XL, Xia Q, Cheng ZX, Zhang YW, Liu QC. Influence of beginning time of hypothermia treatment on prognosis of extensive cerebral infarction. Zhongguo Wei Zhong Bing Ji Jiu Yi Xue. 2005;17:180-182. Zheng PY, Jin Y, Zhang YE, Kong XM. Treatment of large area acute cerebral infarction. Nao yu Shenjing Jibing Zazhi. 2001;9:159-160. Liao XL, Wang YL, Pan YS, et al. The recanalization and prognosis of acute cerebral infarction patients with middle cerebral artery occlusion after intravenous thrombolytic treatment. Zhongguo Cuzhong Zazhi. 2016;11:824-828. Jiang W, Zhou XY, Zhou SN. Clinical application of vasodilators in the acute phase of ischemic Stroke. Zhongguo Quanke Yixue. 2017;20:720-724. Yan X. Research progress of decompressive hemicraniectomy for malignant middle cerebral artery infarction. Zhonghua Shiyong Zhenduan yu Zhiliao Zazhi. 2015;29:435-437. Barrio P, Ortega L, Guardia J, Roncero C, Yuguero L, Gual A. Who receives Nalmefene and how does it work in the real world? A single-arm, phase IV study of Nalmefene in alcohol dependent outpatients: baseline and 1-month results. Clin Drug Investig. 2017. doi: 10.1007/s40261-017-0590-4. Millier A, Laramee P, Rahhali N, et al. Cost-effectiveness of Nalmefene added to psychosocial support for the reduction of alcohol consumption in alcohol-dependent patients with high/very high drinking risk levels: a microsimulation model. J Stud Alcohol Drugs. 2017;78:867-876. Sugishita K, Su Z, Li F, Philipson KD, Barry WH. Gender influences [Ca(2+)](i) during metabolic inhibition in myocytes overexpressing the Na(+)-Ca(2+) exchanger. Circulation. 2001;104:2101-2106. Matzke GR, Frye RF, Alexander AC, et al. The effect of renal insufficiency and hemodialysis on the pharmacokinetics of nalmefene. J Clin Pharmacol. 1996;36:144-151. Zaki PA, Bilsky EJ, Vanderah TW, Lai J, Evans CJ, Porreca F. Opioid receptor types and subtypes: the delta receptor as a model. Annu Rev Pharmacol Toxicol. 1996;36:379-401. Akil H, Watson SJ, Young E, Lewis ME, Khachaturian H, Walker JM. Endogenous opioids: biology and function. Annu Rev Neurosci. 1984;7:223-255. Chang RC, Rota C, Glover RE, Mason RP, Hong JS. A novel effect of an opioid receptor antagonist, naloxone, on the production of reactive oxygen species by microglia: a study by electron paramagnetic resonance spectroscopy. Brain Res. 2000;854:224-229. Soyka M. Nalmefene for the treatment of alcohol use disorders: recent data and clinical potential. Expert Opin Pharmacother. 2016;17:619-626. Du R, Teng JF, Wang Y, Zhao XY, Shi ZB. Clinical study of Butylphthalide combined with Xue Shuan Tong on serum inflammatory factors and prognosis effect of patients with cerebral infarction. Pak J Pharm Sci. 2015;28:1823-1827. Gao X, Ma F, Zhao Q, Zhang Y, Du Y. Acupuncture method of “Huoxue Sanfeng, Shugan Jianpi” for morning blood pressure in patients with cerebral infraction combined with essential hypertension: a randomized controlled trial. Zhongguo Zhen Jiu. 2016;36:459-462. Zhang C, Zhao S, Zang Y, et al. The efficacy and safety of Dl-3n-butylphthalide on progressive cerebral infarction: A randomized controlled STROBE study. Medicine (Baltimore). 2017;96:e7257. Fu J, Zeng M, Shen F, et al. Effects of action observation therapy on upper extremity function, daily activities and motion evoked potential in cerebral infarction patients. Medicine (Baltimore). 2017;96:e8080. Jia XF, Hong Z, Fan JH, Zhang YM. Clinical effect of mechanical fragmentation combined with recombinant tissue plasminogen activator artery thrombolysis on acute cerebral infarction. J Biol Regul Homeost Agents. 2016;30:821-826. Chinese Society of Neurology, Chinese Medical Association. Diagnostic criteria of various types of cerebrovascular diseases. Chin J Neurol. 1996;29:379-380. Teasdale G, Jennett B. Assessment of coma and impaired consciousness. A practical scale. Lancet. 1974;2:81-84. All authors participated in the design of the study protocol, evaluation of preliminary results, contributed to preparation of the manuscript, and approved the final version of the manuscript. The study protocol was approved by the Ethics Committee of First Hospital of Jilin University of China. The study protocol was registered with Chinese Clinical Trial Registry (registration number: ChiCTR-IOR-17013871).